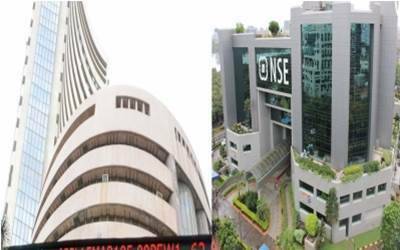 Mumbai, May 25 (IANS) The Indian equity markets on Thursday traded with gains on the back of positive global cues, a strong rupee and healthy buying in capital goods, banking and IT stocks. The key indices traded with gains of more than half a per cent each on the day of expiry of May futures and options (F&O) contracts. The wider 51-scrip Nifty of the National Stock Exchange (NSE) traded above its psychologically important 9,400-mark. Around 12.50 p.m., it rose by 51.80 points or 0.55 per cent to 9,412.35 points. The 30-scrip Sensitive Index (Sensex) of the BSE, which opened at 30,374.81 points, traded at 30,454.96 points (at 12.52 p.m.) — up 153.32 points or 0.51 per cent from its previous close at 30,301.64 points. The Sensex has so far touched a high of 30,503.39 points and a low of 30,352.26 points. The BSE market breadth was bullish — with 1,582 advances and 887 declines. "Equity benchmark indices started off the last trading session of the current month expiry on a firm note, tracking positive global cues and appreciation of the rupee against the US dollar. Both the indices witnessed some recovery in early trades," Dhruv Desai, Director and Chief Operating Officer of Tradebulls, told IANS. "Banking stocks are currently witnessing strong buying support with shares of SBI, Yes Bank and ICICI Bank trading with over one per cent intra-day gains. IT, auto and realty sector stocks are currently supporting the recovery in Indian equity markets." On Wednesday, the NSE Nifty fell by 25.60 points or 0.27 per cent to close at 9,360.55 points, while the Sensex closed at 30,301.64 points — down 63.61 points or 0.21 per cent.